You are here: Home > Last Weekend to Win the Christmas Bonus. Become a Multi-Millionaire! Published on December 1, 2018 at 12:00 am . Happy Holidays! Make it a holly, jolly Christmas. You deserve a Christmas Bonus! 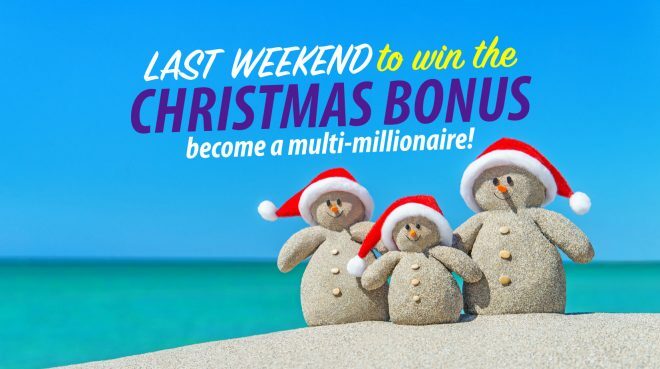 And if you get your tickets now, you’re be in for the Millionaire Lottery’s Christmas Bonus Draw – to win a $40,000 Vacations prize from Carlson-Wagonlit, or $33,000 tax-free Cash. This is the Last Weekend to get in for this year’s final Bonus Draw! And when you buy early, you can win more – your tickets will be automatically entered into the $200,000 Early Bird Draw and the $3.2 million Grand Prize Draw, too. 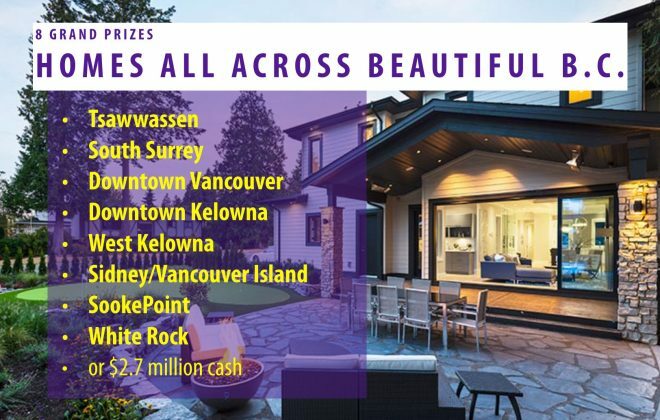 Choose your favourite Millionaire package, with amazing Homes all across beautiful British Columbia – in South Surrey, sunny Tsawwassen, Downtown Vancouver, West Kelowna or luxury living in Downtown Kelowna at One Water Street, a two-condo package in wonderful White Rock and idyllic Vancouver Island living at SookePoint, or a gorgeous oceanview home in Sidney. By choosing $2.7 million tax-free Cash! For just a little bit more… there’s millions to win! This year’s 50/50 jackpot could grow to $2.2 million – it could be the biggest 50/50 jackpot in BC! And when you get your Daily Cash PLUS tickets, you’re in to win an extra $300,000 cash. 209 winners, 105 days of winning! 50/50 PLUS and Daily Cash PLUS tickets must be ordered in conjunction with your Millionaire Lottery main ticket. We All Need VGH… and VGH Needs You. Your Millionaire Lottery ticket supports specialized adult health care and research in Vancouver, at Vancouver General Hospital, UBC Hospital and GF Strong Rehab Centre. Every year, VGH performs more than 30,000 surgeries and treats more than 600,000 patient visits. We treat 60% of British Columbia’s adult trauma cases – and 50% of our surgical patients are from outside Vancouver. This is truly B.C.’s hospital, and the Millionaire Lottery is truly B.C.’s hospital lottery. Transforming health care. Saving lives. Thanks a million. The Ultimate Dream Home for Only $20 – The Affordable Stocking Stuffer!